At "permablitzes" organized by Portland's Resilience Hub & Permaculture Meet-up Group, community members gather for one-day work parties to help convert participants' yards into self-sustaining ecosystems that will eventually provide food for the people who live there. Photo courtesy of the Resilience Hub. With respect to ecosystem repair, there are several things we can easily do that nature struggles to accomplish—such as moving nutrients uphill; moving nutrients from the ocean back to land; slowing water on steep slopes; and planting trees appropriate to the changing climate. All these things can be done by people with just a small amount of planning and effort. Systems that mimic nature are more sustainable, whereas human-created systems tend to be linear in their design, consuming resources and creating unusable waste. Natural systems maintain a closed loop, where waste from one element becomes input for another element. Nothing is depleted, and nothing accumulates into pollution. In permaculture, before introducing a new element to the design it is important to consider what that element adds and what it takes away or consumes in relation to the other elements in the system. Chickens, for example, need food, but if you already have a surplus of grain and ticks, their food is provided in the system. They need a place to scratch, but if you have patches of land that need cleaning up, they will do the work for you. They produce manure, but if you have a garden, it needs the fertilizer. They produce eggs, but if you already have bacon... well then, you’ve got breakfast! Permaculture is not about making single-species orchards but actual “food forests”—trees, ground covers, vines, understory trees, mushrooms, animals, all working together to make a cohesive whole. While we commonly think of pines and birches dominating Maine’s forests, the land here supports many species of fruit and nut trees. Permaculture encourages forest-friendly ecosystems not only because they are the most natural and regenerative state for the land but because, when intentionally designed, that forest will feed your family. If left to themselves for a few thousand years, most places with enough resources will become forests. A firmly established forest, which is a complete ecosystem unto itself, will remain until there is some drastic upheaval. As any of your farming ancestors will tell you, creating a field where a forest is growing is a ton of work. Creating a forest out of a field requires just a tiny push in the right direction. WATER: Water is a limiting factor for many ecosystems. It wants to run downhill as quickly and easily as possible. In many ways, we have encouraged water’s rapid downhill trajectory with drainage ditches, storm sewers and so on. Permaculture aims to hold water high up for as long as possible, to move it so that all parts of the landscape receive it and allow it to soak into the soil. In the process, plants are fed, eroded material is released and groundwater and aquifers are maintained. Historically, in Maine, we get about 44 inches of precipitation spread evenly throughout the year— though this may be changing. This water can be captured and controlled with small dams to create ponds; in paddies for weed control for some crops; in irrigation ditches; and in swales (level ditches) which—seemingly paradoxically—work both to disperse and to collect water and make prime tree-planting structures. A swale is a long earthwork structure, laid out on contour, with a soft mound on the downhill side. Since it is level, any water falling on the swale will flow in both directions, maintaining a similar depth across its entire length. Since it is made of soft, loose soil, water can seep through the mound slowly, re-hydrating the landscape. Commonly, swales are configured with one end at a pond: this allows the swale to run excess water into the pond for storage, while within the same structure, when the pond is overfull, sending water back down the swale, spreading along and soaking its full length. When both the pond and the swale are saturated, a wide, strategically-placed spillway can release excess water. Trees planted on the swale mound have access to water without risk of drowning. And swales can be scaled to different sizes depending on the climate. In a desert, swales need to be huge to contain a large, but infrequent, volume of rain. 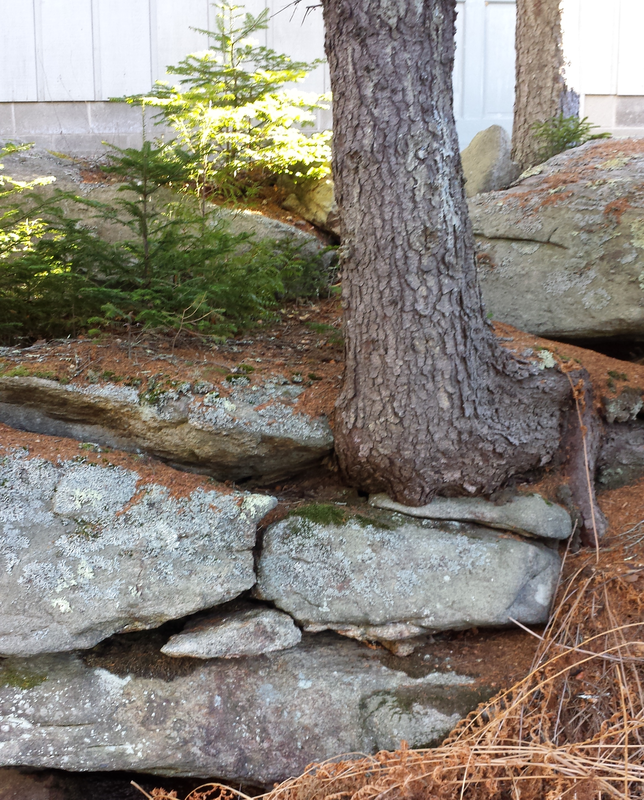 Here in Maine, a swale can be a foot or less in height in many places. Swales and connected ponds provide a solution to our recent dry summers. HAY FIELDS: While permaculture specializes in trees, most of Maine’s forests do not naturally provide an abundance of food that we can eat. Pre-existing forests would need to be converted to host food-producing trees. But Maine’s large area of open fields provide a clean slate where a food forest can be carefully designed. Hayfields create small income (a bale of hay sells for less than a pint of raspberries), require large machines and are vulnerable to freak rainstorms. The equivalent area planted as a food forest could be a lucrative enterprise, while also feeding the farmers. Often, the first step in implementing a full permaculture design is to create earthworks, including dams for water storage; swales for collecting and dispersing water; terraces for planting crops; and paddies for some weedfree crops such as rice and cranberries. These are far easier to construct if the ground is clear of trees and stumps (not to mention those ubiquitous New England rocks). Once the earthworks are complete, the area can be planted with fruit trees, support trees and plants (for extracting nitrogen from the air and other nutrients from the soil) and any other plants that will make a complete ecosystem. Since they were used for intensive farming over 150 years ago, most hay fields have little history of chemical pesticide, herbicide and fertilizer application. This means that less work is required to re-mediate the soil before building it up for increased fertility. POPULATION: Permaculture works well in a variety of areas, from small plots in dense city environments to large regions like the 150 million-acre Leoss Plateau in China. However, the amount of work required for successful permaculture systems varies. A tiny city planting can produce record amounts of food per square foot, but such spaces require intense attention to flourish. In Maine, on the other hand, a few acres are easy to acquire. And this is enough land to host not only a productive garden but also a reasonably-sized food forest, grazing land for animals and even an untouched bit of nature to use as inspiration and for teaching. Maine’s low population and low rate of population growth means that land for food forests can be purchased without having to compete with land for new houses. Maine’s population includes an expanding community of young farmers who are prepared to experiment and want to do the right thing for the planet, along with a legacy of farmers—both native and non—who have been tending this land for decades and who know the particulars of growing here. So, consider replacing that lawn, or hayfield, with something that will provide you and your family with healthy, tasty food, all with less energy than you currently spend mowing the grass, while at the same time helping the planet. Re-printed from the fall/winter 2019 issue of Green & Healthy Maine HOMES. Subscribe today!